General Appearance: Compact, short coupled and well knit with an almost square outline.Firm condition,the profuse coat not disguising any lack of substance. 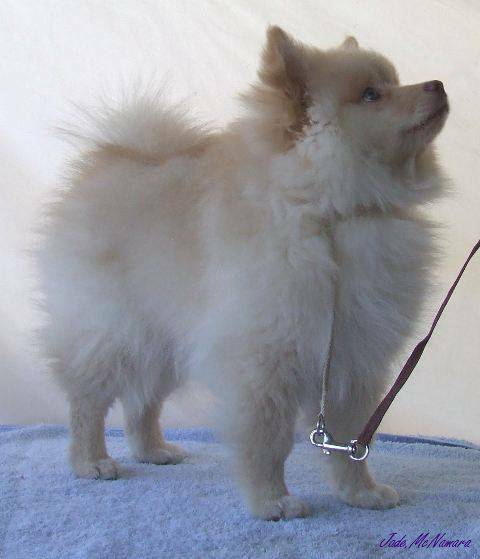 Characteristics: The German Spitz is intelligent,active and alert. It's buoyancy,independence and devotion to the family are breed characteristics. Temperament: Happy,equable disposition, showing confidence, with no sign of nervousness or aggression. muzzle approximately half length of head. Cheeks clean. Flews tight, no trace of lippiness. Nose: Black in black, white, black/white parti-colours, black/tan bi-colours. Self colour as compatible with coat colour in other colour varieties. black/tan bi-colours. As dark as compatible with coat colour in other colour varieties. Mouth: A perfect regular and complete scissor bite, i.e. upper teeth closely overlapping the lower teeth and set square to jaws. Black lips in black, white ,black/white particolours, black/tan bi colours. Colour as compatible with coat colour in other colour varieties. Forequarters: Moderately sloping shoulder; upper arm of sufficent length to ensure elbow is vertically belowpoint of withers. Moderate forechest. Elbows equidistant between ground and withers, turning neither in nor out. Well-boned,straight legs. Pasterns strong and flexible. Body: Length from point of shoulder to point of buttocks equal to height at withers; short, well developed loin. Moderate tuck-up. Well ribbed-up and rounded. Distance from brisket to ground not less than half the height from ground to withers. Top-line level. Hindquaters: Moderate angulation with hocks moderately well let down. Neither cow hocked nor wide behind. Gait/Movement: Moving without exaggeration from any angle. Straight coming and going. Viewed from side, effortless, brisk action, retaining topline. Coat: All colour varieties and markings acceptable. Butterfly pigment not permitted with any colour. in exact prportion to it's degree and it's effect upon the health and welfare of the dog. Note: Males animals should have two apparently normal testicles fully descended into the scrotum.